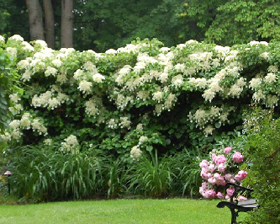 The Climbing Hydrangea is deliciously fragrant! It looks lovely climbing or cascading over rock walls with its heart shaped leaves and cinnamon colored stems which provide a wonderful contrast for the white flowers. Sow in autumn/winter in a seed tray and keep outside with a clear lid. Seeds emerge in the spring and summer. Or sow in a seed tray and place in a fridge for a month, then into room temperature and seeds germinate within a couple of months.